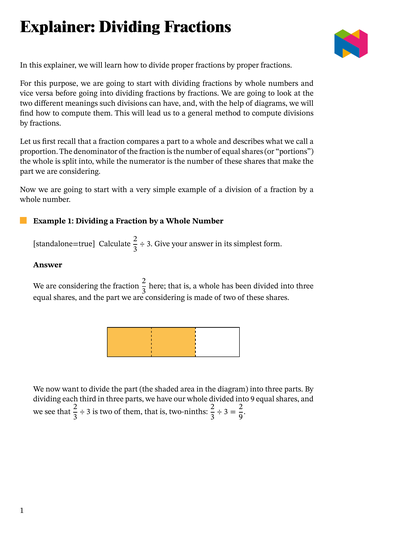 In this lesson, we will learn how to divide whole numbers by fractions and fractions by both whole numbers and fractions. 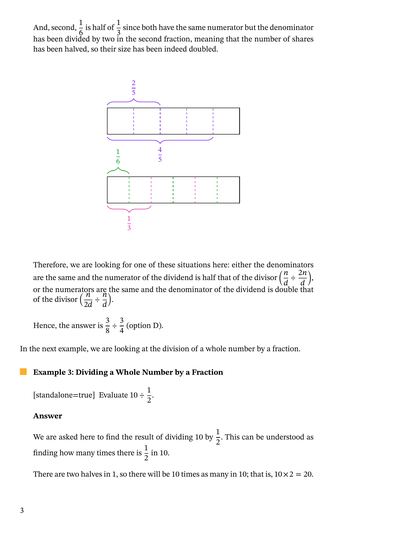 Which of the following division expressions has a quotient of 2 3 ? Calculate  2 3 2 4 ÷ 5 6  − 4 5 . Give your answer in its simplest form. A bottle can hold 3 1 0 litres of oil. How many bottles are needed to store 12 litres of oil? Bassem practices his trumpet for 20 minutes per day. His trumpet teacher said it is only two-thirds of the daily practice required at his level. How long should he practice every day? Mariam has taken four-fifths of her cows, or 16 cows, to the next field. How many cows does she have in total? Adel’s phone screen has an area of 48 cm2, which is four-thirds of the area of Bassem’s phone screen. What is the area of Bassem’s phone screen? Dina wants to make pancakes with a half litre of milk. Knowing that one-eighth of a litre of milk makes pancakes for one person, for how many people will his pancakes be? Find 6 7 ÷ 3 7 . What is 3 8 divided by 6? Find 1 2 ÷ 2 3 . Calculate 2 3 ÷ 3 . Give your answer in its simplest form. How many people can share 18 pizzas if each person gets 6 7 of a pizza? Rania has of a pizza which she divides into two equally sized slices. What fraction of the original pizza is each slice? Milos bought 4 bottles of soda for a family gathering. After the gathering had been going for 1 hour, the cola bottle was 1 6 full, the lemon-lime bottle was 1 2 full, the cream soda bottle was full, and the cherry soda bottle was 1 3 full. If the soda was served in cups and each cup was 1 6 of a bottle, how many more cups can be poured? How many tenths are there in a fifth? 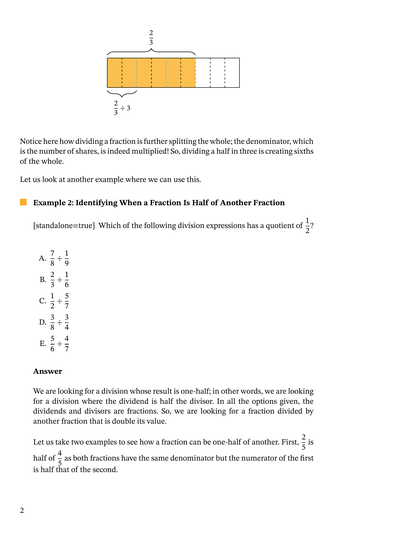 When 3 4 is divided by a fraction 𝑎 𝑏 , the result is 5 8 . 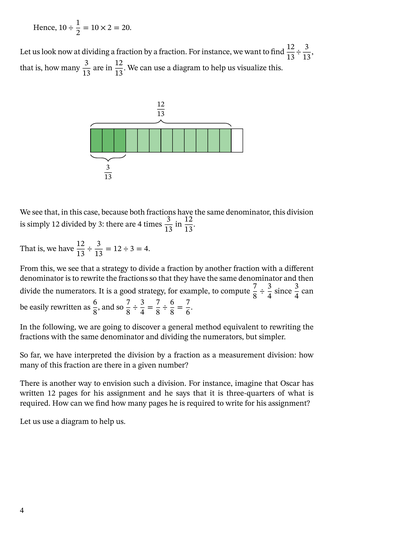 Determine 𝑎 𝑏 .
Oscar has written 12 pages for his assignment. It is three-quarters of what is required. The diagram below can be used to find how many pages Oscar is required to write for his assignment. Using the diagram, find what operation performed on 12 gives the number of pages required. The 12 pages are 3 4 of the number of pages required, which can be written as 1 2 = 3 4 × number of pages. What division gives this number of pages? Combine the previous answers to show the equivalent operation to 1 2 ÷ 3 4 . One-eighth of a pot of paint will paint one square meter. What area can be painted with three-quarters of a pot? Use the diagram to find 4 7 ÷ 2 5 (i.e., the number that 4 7 is 2 5 of). Find 3 7 ÷ 5 6 . A farmer wants to try a new type of seed. He has bought enough seeds for a field of area 1 1 0 square miles. He wants to plant them in a field of width 1 4 miles. What length of the field will be dedicated to this new seed type? Find 5 9 ÷ 2 9 . Use the diagram to find 4 5 ÷ 1 5 (i.e.,how many 1 5 are in 4 5 ). Sarah picked pounds of cherries from her tree this year. If she only picked pounds of cherries last year, how many times more cherries did she pick this year compared to last year? You can find the result of 1 3 8 ÷ 3 4 by renaming 3 4 as a fraction with 8 as the denominator. Which of the following represents this? The diagram can also be used to solve 1 3 8 ÷ 3 4 . We find that two times 3 4 fit into 1 3 8 , and then we need to find what fraction 1 8 is of 3 4 . Give the result to 1 3 8 ÷ 3 4 as a mixed number.